Schedulefly is a web-based employee scheduling and communication tool designed for the restaurant industry. Its features include sales and labor cost forecasting, team management, time off requests, and more. In this article, we covered user reviews and pricing. Ready to get started with Schedulefly? Get a free trial. Users who gave Schedulefly a positive review said that it makes staff scheduling easier and less time-consuming. Some of them also commended the software’s ability to keep track of shift updates and changes. One user who gave Schedulefly a positive review on G2 Crowd said that the app is intuitive and user-friendly. He mentioned that it allows their staff to easily input their availability, helping managers generate weekly schedules faster. He also added that the system enables them to manage time off and change shift requests from their employees. As of the date this article was written (10/17/2018), there are very few negative Schedulefly reviews online. However, some users complained about the lack of a mobile app. One user who gave Schedulefly a negative review on G2 Crowd said that there’s no mobile app available for download, which forces him to open a mobile browser every time he’s on his work phone. According to him, it is much more convenient if there’s an app that they can easily access on-the-go. Schedulefly offers a single subscription plan that ranges from $30 to $60 per month, depending on the number of employees who will use the software. The system features shift scheduling, an employee database, vacation/leave tracking, and more. Ready to get started with Schedulefly? Get a free trial. How does Schedulefly help simplify staff scheduling tasks? 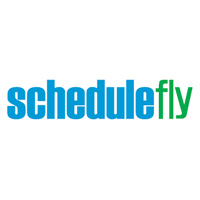 Schedulefly delivers staff schedules via the web, email, and/or SMS. It also allows users to suggest shift changes online. The app sends an updated calendar every morning along with other important notes such as birthdays, company announcements, and more. Is there a need to download or install a system to use Schedulefly? No. Schedulefly is purely web-based; hence, there’s no need to download or install any system. Users can simply open their web browser to access Schedulefly. Not sure if Schedulefly is the right fit for you? Read our reviews of all top employee scheduling software or check out one of these three Schedulefly competitors.